The report focuses on the issues of trust and misinformation, new online business models, the impact of changing Facebook algorithms and the rise of new platforms and messaging apps. 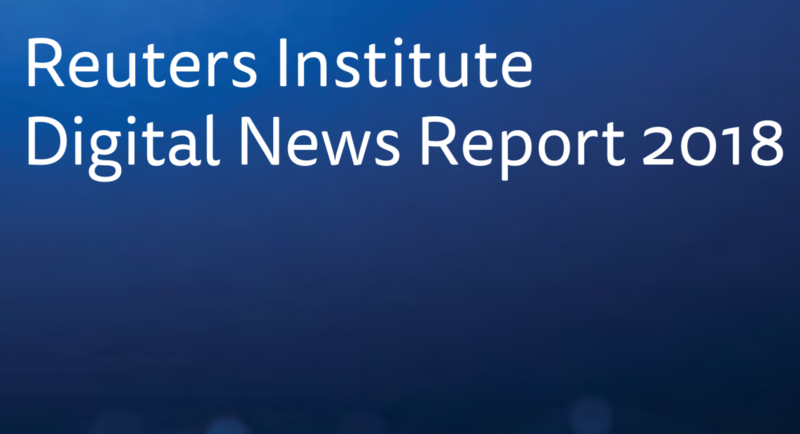 This study has been commissioned by the Reuters Institute for the Study of Journalism to understand how news is being consumed in a range of countries. Research was conducted by YouGov using an online questionnaire at the end of January/beginning of February 2018. The data were weighted to targets based on census/industry accepted data on age, gender and region to represent the total population of each country. The sample is reflective of the population that has access to the internet. As this survey deals with news consumption, we filtered out anyone who said that they had not consumed any news in the past month, in order to ensure that irrelevant responses didn’t adversely affect data quality. This category was lower than 1% in Finland, averaged around 3%, but was as high as 8% in the United States. A comprehensive online questionnaire was designed to capture different aspects of news consumption. Face-to-face focus groups were held in the US, UK, Germany & Brazil. Towards a sustainable model of journalism innovation in an era of perpetual change.